Here we have an amazing 1974 Imperial LeBaron 4 door hardtop in Dark Chestnut Metallic paint. LeBaron’s came with a 440 cubic inch V8 with TorqueFlite 3-Speed Automatic Transmission as standard. Other standard equipment included; air conditioning, power windows, power steering and powered radio antenna. Power disc brakes were fitted to all four wheels. Imperial also used an electronic ignition system. Not bad for a passenger car in ’74. 1974 saw a new grille with 'waterfall' styling not too dissimilar to the Lincoln Continental and the wraparound front signal lights also had a touch of Continental about them. 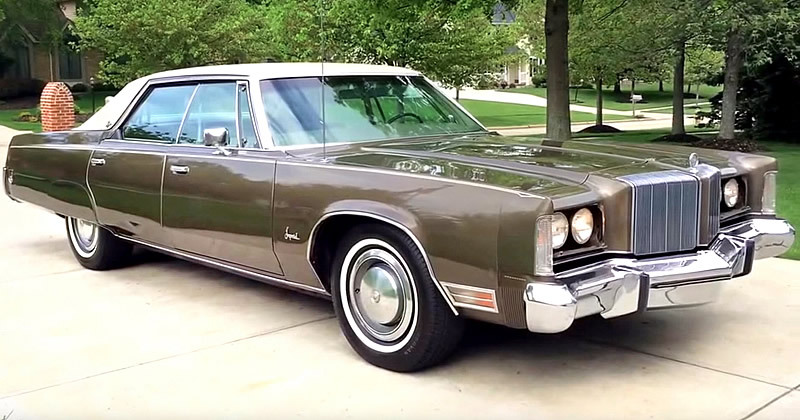 The 4 door hardtop came in at $7230 for 1974 and Imperial produced 10,576 of them during that model year. Unfortunately these big cars coincided with the oil crisis which dampened sales considerably. Have a look at the plush interior!